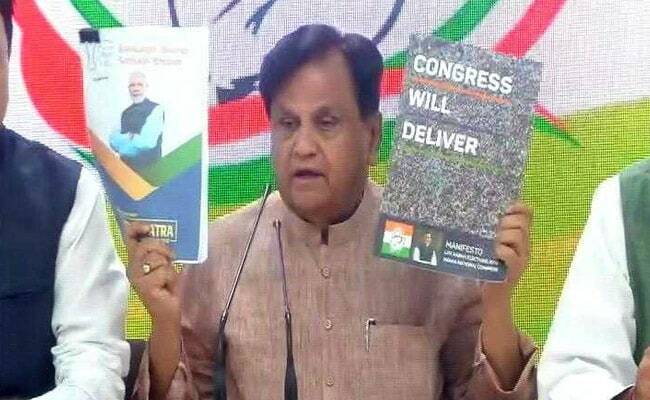 In scathing criticism of the BJP's manifesto, Congress leader Ahmed Patel said the BJP has "simply copy pasted" its 2014 poll document and changed all previous deadlines. Ahmed Patel said the BJP should have come out with a ''maafinama'' instead of a manifesto. The opposition today shredded the BJP's manifesto for the national election that made a string of promises, including scrapping a law for special rights to residents of Jammu and Kashmir and doubling farmers' income by next year. In scathing criticism of the "Sankalp Patr", Congress leader Ahmed Patel said the BJP has "simply copy pasted" its 2014 poll document and changed all previous deadlines. Mr Patel said the BJP should have come out with a ''maafinama'' (letter of apology) instead of a manifesto. "The difference between BJP manifesto and Congress manifesto can be seen firstly from the cover page. Our's has a crowd of people, and BJP manifesto has face of just one man. Instead of a manifesto BJP should have come out with a 'maafinama'," Mr Patel said. The manifesto also promises to revise tax brackets to help the middle class if it is voted back to power. Mr Patel said the difference between the BJP's manifesto and that of the Congress can be seen from the cover page itself. Congress's Twitter handle used the hashtag #BJPJumlaManifesto to attack the manifesto. The manifesto, themed "Sankalpit Bharat - Shashakt Bharat" or "determined India, empowered India", also "reiterated" the promise of a Ram temple at Ayodhya and pledged to "explore all options". "Nationalism is our inspiration, empowerment of weaker sections is our vision and good governance is our mantra," PM Modi said at the launch, adding that it would take India on "one mission, one direction". Union Minister Arun Jaitley said it was not any set of promises envisioned by "the tukde tukde gang or even the Ivy League mindset". "This all Jumla Patra as last time also they made many promises but none was completed. What about saving farmers from committing suicide?" CPM leader Sitaram Yechury said. The Congress presented its manifesto last week, with party chief Rahul Gandhi saying that it focuses on the issues that the common man faces. Its five big ideas, Mr Gandhi said, were poverty alleviation under the NYAY scheme, generation of jobs, a reformed Goods and Services Tax, double budget for education and free healthcare.